It has a sign and a concrete block with a ramp to get heavy items up to the level of the train, what else do you need? It is the nearest point of the railway line to Coober Pedy – Australia’s Opal capital. As before, coaches were waiting for us and at 5 minute intervals left the ‘station’ to take us to town. The interval was needed to provide enough time for the dust from each coach to settle before the next one travelled along the road. In the past, there had been more to Maguri; the foundations of some shepherd houses remain and some sheep too. We passed one of the official opal mining fields which are dotted not only with people excavating drilled rock dust to find opals, but lots of little mounds of rock dust next to holes that were drilled before. Bigger mounds suggest a seam was found, followed and dug up, the smaller ones all signified (to me at least) another failed endeavour. 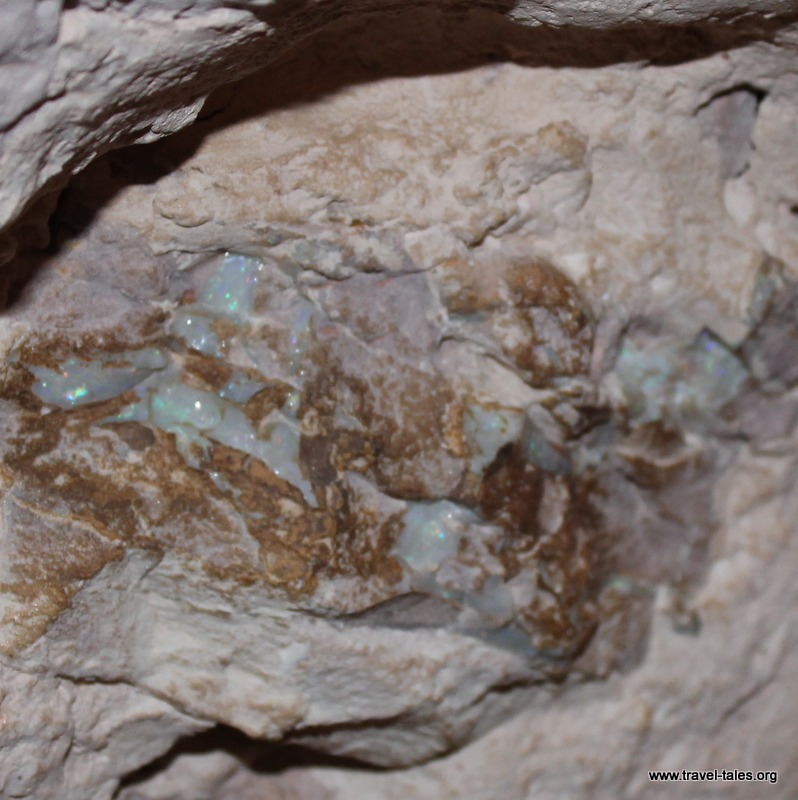 Opal cannot be identified by anything above ground. The only thing guiding a miner is instinct and gut feeling – luck!. Nobody knows whether opal will be found when a hole is drilled. Drilling 30cm next to an empty hole could yield a fortune. Or not. Inside the Umoona Opal Musem we got to see both manual and machine drilled examples of housing in Coober Pedy. It can get up to 50°C outside in the summer so most people live underground in the excavated rock. Plumbing is at the front of the property so as not to have to bring water pipes too far into the rock, although electricity wiring is brought all the way to the backs of houses. There are usually airshafts for the back rooms, so an inhabited hill is clearly recognisable. The museum also contains some mined areas, giving a good idea of what opal mines feel like. They even left some opal un-mined, more money is made showing it off than taking this bit out and selling it! We were given a talk on how to go about opal mining, and I’m afraid I decided not to switch career to mining by luck. Coober Pedy is also home to the only golf club which had reciprocal playing rights at St Andrews, Scotland. It is a rather unusual golfing surface, with the Scottish sense of humour on clear display.